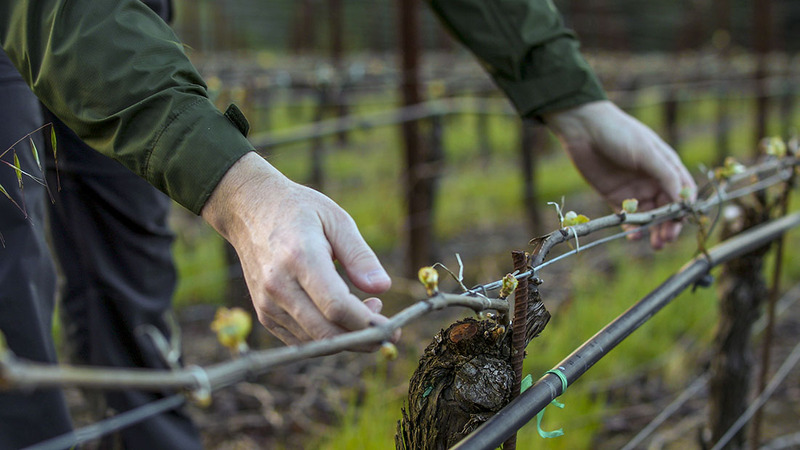 In terms of raw material, it doesn’t get better than the Wente selection from Hyde Vineyard if the goal is to create a wine of power and richness, but also balance and persistence. This fruit has all these components in abundance and it’s our task to gently extract and blend them with winemaking influences in a harmonious, subtle manner. This year we chose to add a small amount of old vine Long selection to the Wente which added a subtle floral high note and honeysuckle richness. This selection’s striking natural acidity shows a lovely fresh saline quality that further enhances the wine’s dynamic balance. Despite the wine’s obvious upfront richness, its youthful green color and firm structure, currently somewhat hidden under all the extract, makes me confident as to its aging prospects. I would estimate a drinking window of five to seven years. If you favor richness and drama then drinking on release is for you. With bottle age the sweet, nutty character will develop, along with an aromatic hint of petrol and deepening texture. Youthful straw color. Lemongrass, pear and citrus notes deepen to quince, white peach and a whiff of honeysuckle. The palate follows the nose with a firm core of grapefruit intensity and an edge of pepper and mint. Great natural richness and texture as the mid-palate expands. Beautiful crisp acidity with lingering citrus notes on the penetrating finish. Serve no cooler than 55 degrees. Drink between 2010 and 2016.